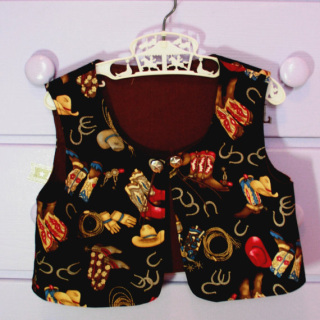 This little vest will set your rodeo princess apart from the other cowgirls. The 100% cotton fabric is a chocolate background with pink, orange, green and turquoise flowers. Each flower center is accented with an appropriately colored Swarovski rhinestones. 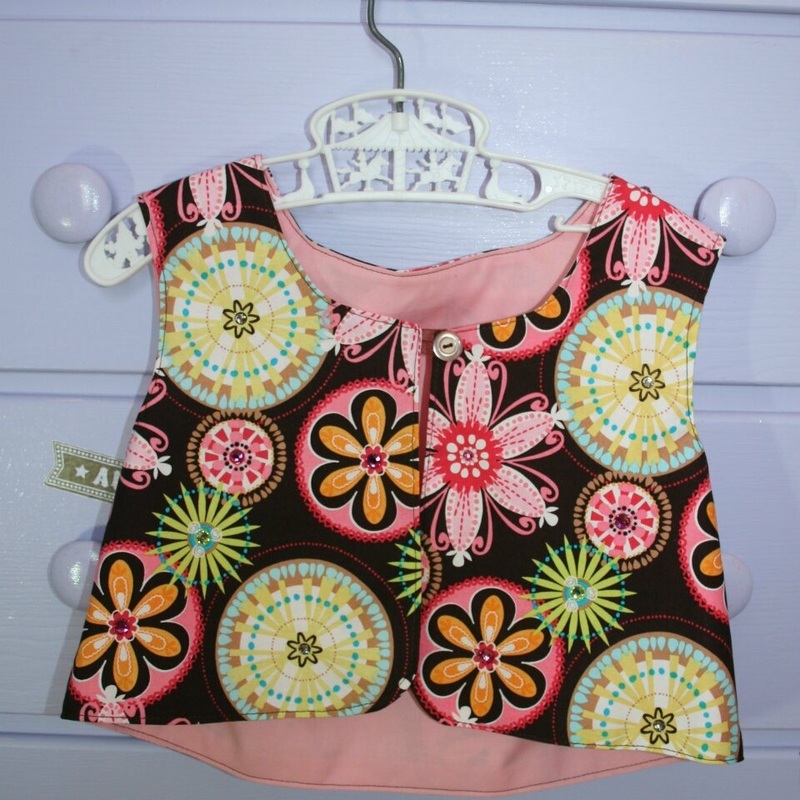 The front of the vest closes with a sheer chocolate ribbon and light pink vintage button. The lining is also 100% cotton and is a light pink in color (please note there is a slight brown tinge to the lining under the left arm). Top-stitched in brown. Would look great with the denim skirt for sale in the skirts section. Size is approximately a 6X, measuring 14" from under armhole to armhole (28" total) and the back length measures 10 3/4" from neck to hem. Although I utilize high quality adhesive for the rhinestones, I cannot guarantee their adhesion through washing in a machine. Thus, I recommend hand-washing this garment. Ride 'em cowgirl! The 100% cotton fabric is a light tan and includes cowgirls on rearing paint ponies, spurs, cowboy boots, cowboy hats, saddles, coffee pots, wagon wheels, steer skulls and cacti, all in shades of red, pink, brown and green. The front of the vest closes with a red grosgrain ribbon and red vintage button. The lining is also 100% cotton and is a matching brown in color. Top-stitched in brown. Adding a touch of whimsy is faux-suede fringe along the back hem. Size is approximately a 6X, measuring 14" from under armhole to armhole (28" total) and measures 12 3/4" from neck to the bottom of the fringe. Purchase the matching denim and fringe skirt and save on shipping! 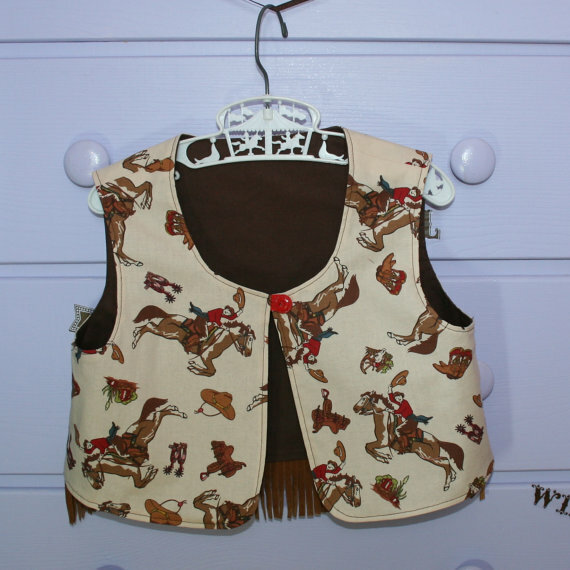 This black vest has vintage cowgirl inspired boots, spurs, horseshoes, ropes and gloves done in tans, browns, reds and blues. It is 100% cotton, as is the chocolate lining (the lining appears plum in the photo but it is chocolate). The front appears to close with two silver buttons that have stars stamped onto them but it closes with a hidden hook and eye. Two "fringe" strings hang from each button. The topstitching is done in black. Size is approximately a 6X, measuring 14" from under armhole to armhole (28" total) and is 10 3/4" from neck to hem. This little vest would be adorable when worn with the denim and faux suede skirt listed. Purchase both and save on shipping.